Yesterday I went out to the Mayan village of Chanchen and met with the leaders of this small town. They said that one of their greatest problems was the lack of access to medicine. Rodolfo, the mayor, said most could pay for the medicine but the trip into town is the difficulty. The closest pharmacy is 30 miles away and these people do not have cars. It’s hard for us to think about but if you had a fever and or a headache could you imagine riding a bike 60 miles. They have the building for the pharmacy and we think we can help them buy basic medicine to get started. Please pray for this Pharmacy Project. March 7th a volunteer mission team will be coming down lead by Pastor Terry Hill from Alaska. WE NEED YOUR PRAYERS AND SUPPORT. We have had about 28 of our church members working as volunteers with the Golf Channel at the Mayakoba PGA tournament this week. We have all had a great time maybe a little to much sun but it is Mexico. Tomorrow should be a full day church services in the morning than the Golf tournament in the afternoon. Please pray for our services and for our witness at the tournament. I had a real encouraging meeting today with Rodolfo, the mayor of Chan Chen. He is not a believer yet but he is excited about our plans to work in his village. He was happy that we and planing to show the Jesus film in Mayan next month. He said we can use the school for anything we want to do. One of the first thing we are going to do out in Chan Chen is try to set up a small pharmacy. We are also going to build a small place to house volunteer groups. 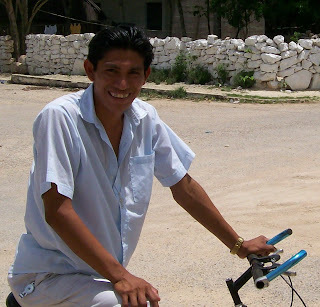 Please pray for Rodolfo and the village of Chan Chen…. We plan to start in May with 4 small groups on the Spanish side of the church. We have a plan for each group to reproduce every six months. If we could see this plan through for 5 years we will have over 4000 small groups...... The power of God and multiplication. Tomorrow morning I am meeting with the Mayor of Chan Chen to talk about plans for our on going ministry in this Mayan Village. Please pray for us as you read this update. Friday Feb. the 15th is going to be a very important day in the life of our ministry here in Playa Del Carmen. Friday morning I and a couple of leaders from the church here are planning to go out to the Mayan zone to find a place to build our mission center. This will be a place to teach our ESL classes, setup our medical clinics and house volunteer teams. We don't have the money to make it all happen yet but we are going out believing that God is going to provide. Please pray that God will open the doors in the village of Chan Chen and that we have the faith and the money we need to see this happen. Friday night we planning to have a leadership meeting at our home in Paamul. This meeting is going to be the most important meeting we have has as a young church. We are going to call these church members to a higher level of commitment. My hope is by May we are going to double the number of small groups as a result of what God is going to do at the meeting Friday night.Pray that the people will leave this meeting with a willing and an excited to serve the Lord through our new church. Pray that God will open these new homes for small groups and pray that hundreds of people will come to know Christ as our leaders open their homes and hearts. Thanks so much for your prayers and support…. 'Transform” and the words “change of your mind”. Those are the keys. How is it that we are transformed? We are transformed by having our minds changed.It seems that almost everyone wants "Change" today. Of course few people would agree on what that change should be. I talk all the time about seeing this part of Mexico Changed by the power of God. But what are we talking about? Is it like the political slogan that can gain the support but few understand what we are talking about? How would this part of Mexico really be different if we were to see a true movement of God changing lives? 1. We would see a great hunger to know and do God’s word. 2. We would see thousands of people volunteering to serve one another out of love. We would have servant leadership at all level. Home, Workplace , church, government etc…..
4. We would see hope for the poor as the churches and local government works togather to meet their medical needs and offer a better Education.